It started out like any other day for Matthew Rooda, 16BA, who a few years ago was balancing community college classes with his job at Schneider Pork Farms outside of Waterloo, Iowa. When he arrived at work, though, he discovered a disheartening situation—nine deceased piglets crushed beneath their mother. Piglets getting crushed by their mothers is a complicated issue that farmers have been struggling with for decades. As many as six million piglets die every year as a result, according to the United States Department of Agriculture. That’s approximately 5 percent of all piglets. Rooda went looking for a solution and enlisted a friend, Abraham Espinoza, whom he met in Waterloo. With the help of the Founders Club, an incubator at the UI’s Bedell Entrepreneurship Learning Laboratory that supports students as they pursue startup businesses, the duo founded SwineTech in 2015. Rooda and Espinoza now have released a product that is starting to make an impact in the hog industry. The system, called SmartGuard, monitors the wavelengths and frequencies of piglets’ squeals. When it detects a piglet in distress, it delivers a vibration to a patch affixed to the mother, which prompts her to stand and free her piglet. “We’ve worked with animal welfare specialists and veterinarians to ensure that our system doesn’t harm—but helps—the animals,” says Rooda, who, along with Espinoza, has received numerous honors and awards for SmartGuard. 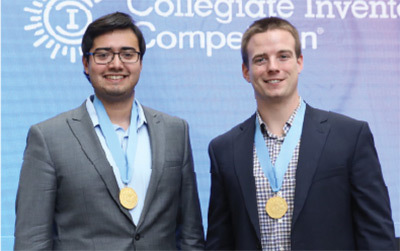 The duo won the undergraduate category of the 2017 National Inventors Hall of Fame Collegiate Inventors Competition, has been named to the 2018 Forbes magazine “30 Under 30” list for manufacturing and industry, and became finalists for the American Farm Bureau Federation Rural Entrepreneurship Challenge, which will be decided this month.